The object appeared as a black dot just above the water line. It was hard to make it out in the fog. But, a few paddling strokes forward confirmed what we were seeing. A harbor seal. And it was checking us out. Looked like a big one, too. This guy had a sizeable head. And, he wasn't intimidated by the arrival on his turf - or should I say in his swimming territory? - of a seven double-kayak posse. 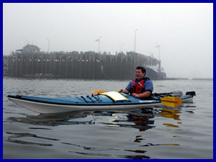 Sea kayaking on New Brunswick, Canada's Bay of Fundy out of the tiny resort town of St. Andrews-by-the-Sea is a pretty laid back affair. At least it was that morning. The water was dead calm, and the fog was thick. The cool thing about being on open water in fog is the combination of how far sound travels in a tranquil environment. It's almost impossible not to relax. But, it's relaxation with an exploratory edge. A ton of islands pop out of the sea up here, and they harbor a wide array of creatures. When the water’s calm like this, and the paddling’s easy, it's almost impossible not to be fascinated as you cut readily through the water from one island to the other, keeping a keen eye out for puffins, cormorants, ducks, seals and - yes - even the occasional whale. And the easy-going cool factor increases when you're out there under the educated and watchful eye of a good outfitter. 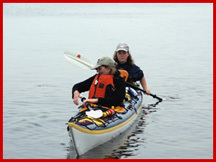 In this case, the outfitter was Seascape Kayak Tours, who sent three guides to accompany our little band of eight, including the company's main man, Bruce Smith. The boats supplied were excellent, seaworthy, two-person craft; very stable in the water, with plenty of storage space for overnighting somewhere or even just for bringing along a camera or a picnic. Time and obligations didn't allow us to do any extended exploration, but these guys lead plenty of two- and three-day trips, and even longer ones. And, they're more than happy to have kids along. "We've taken kids as young as four," Smith said when I asked him about family outings. "If the kids are too young to paddle, we set them up so they can ride in the kayak's middle storage compartment." The only restriction for young families is that they must book private outings. "We don't want little ones slowing down a regular group," Smith explained, "and this way if a child gets tired or restless with the paddling, we can pull onto an island and let him run around, or hunt for shells." Older children, however, who have the size, strength, stamina and interest - say from age twelve or so - are certainly welcome on regular trips. Mr. Seal, our newfound friend, followed us for a while. He kept a certain distance, but he seemed happy enough to see us. We paddled around the edges of Navy Island and watched a couple of cormorants dive for food. And, all too soon, the mini adventure was over. It was just a taste of what was out there. But, it tasted good enough to know it'd be worth coming back to explore these island-pocked waters some more in this easy-going way.